Deon Meyer has followed up his most straightforward book, the relentless Thirteen Hours, with his most complex, the forthcoming Trackers. As is usual with Meyer, characters recur from his other books, from the earliest to the most recent. Lemmer, the bodyguard, Mat Joubert, the cop (now former cop) and several of his colleagues, as well as several other minor characters, put in appearances. There are several kinds of trackers in Trackers: animal trackers, spy trackers, private detectives, and more. In the first and third sections of the book, we follow a Presidential Intelligence Agency, whose head is trying to keep the agency independent in the face of a consolidation of the South African intelligence services, and recruits a team of stray white people (beached in one way or another by the rapidly changing society) as information analysts. One of them is a housewife who has abandoned her abusive husband and useless son to seek a life of her own (as a writer, she hopes). The agency is caught up in the pursuit of an Islamic terror cell that is planning a big event. The second section follows Lemmer (telling his own story in the first person), living happily in the desert-like, remote Bo-Karoo area with the girlfriend he acquired in Blood Safari, the previous book featuring him as a main character. 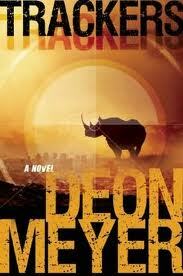 He is suddenly and inexplicably offered a job protecting a pair of black Rhinos that are being smuggled out of Zimbabwe (most often referred to as Zim by the novel's characters) for their own (and their species') protection. There are hidden agendas, though, that end with Lemmer in pursuit of a tracker who has disappeared with evidence implicating Lemmer in a murder. The last section follows Joubert's first case as a private investigator, working for a large firm that seems more concerned with making money than solving cases. His case concerns a man who disappeared some time before, and his wife has raised the money for a private investigation since the police put no effort into finding him. 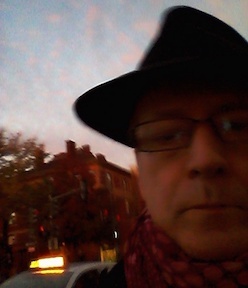 The three threads intersect in unexpected ways, leading to twisty and satisfying plot developments. There are elements of the Graham Greene or Eric Ambler school of writing in the spy sections, with the reader understanding more of what's happening than the spy catchers do, with considerable irony. There's also one plot development that the reader may think has been undercut by history--but be patient, what seems at first like an error becomes logical in the end. There is much that Deon Meyer fans will recognize and appreciate in Trackers, as well as a lot of new and interesting developments. 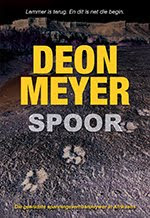 I've been a fan since Meyer's first two novels were translated into English from Afrikaans (one featuring Mat Joubert), and Trackers reinforces my appreciation for Meyer's work (he's certainly the "dean" of South African crime writing). I've pasted in the U.S. (Rhino) and U.K. (road image) as well as the Afrikaans editions: of the three, I think I like the U.K. one best and the U.S. one least, though the rhino cover does have a certain appeal--both refer to the Lemmer plot more than the other threads (which indeed are harder to represent). Thoughts? I'm very much looking forward to this one (so have only skimmed your review). Glad to see that Lemmer is back, and Joubert. 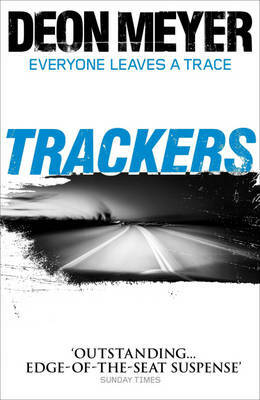 Just completed reading "Trackers". Meyer just keeps getting better and better. All his books are highly recommended.